Please note there is no such thing as a digital TV aerial or a Freeview aerial - it's simply not true. There are aerials that look different and perform differently from each other but that's all. If you do have to replace your aerial the installer might point to a neighbour's roof and show you a large aerial with a lot of funny shaped prongs, and say, "that's what you need. That's a digital aerial!" If most of the other aerials on the street are small ones then it's very likely that all you need is a small one. We do a site survey with a specialist calibrated signal analyser so you are assured of not only getting the best possible reception but also getting the correct aerial or dish for your requirements and trouble free reception guaranteed. If you're fed up with birds on your chimney, sitting on your aerial or nesting we can help. We install Digital Audio Broadcast (DAB) radio aerials. Most DAB radios can take an external aerial. DAB aerials are different from FM/AM and TV aerials, so we make sure you have the right type and size for your specific location. Sometimes an indoor aerial may be enough (usually supplied when purchased), however, for the best reception you may need an outdoor aerial. This should ideally be on the chimney or high up on the outside of the building to give good results. We install DAB radio aerials in loft spaces as well. It all depends on the reception. We are a nation of telly lovers and the digital age has brought an endless supply of programmes for us to choose from. The down side is that there's even more squabbling over the remote - and if that stops you watching your favourite programme it's time to get additional TV points to keep the whole family happy. Most newly constructed houses have multiple outlets however if you find you need extra TV sockets just give us a call. We are renowned for discrete cabling, bedroom points, new extensions, conservatory, garage, tree house, shed - We have done them all. Receiving no signal from your digital television or your set top box? ABC Aerials operate a same day / next day service and are on hand to have your TV fully working, usually within hours of your call! 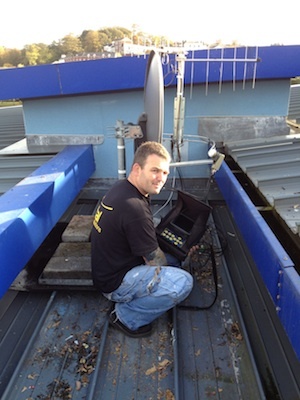 We repair aerials, maintain, replace and upgrade them. We do storm damage repairs and fault finding. If you find you experience reception problems and signal break ups, we may be able to help with this. Sometimes performing a factory reset of your Freeview TV set or set top box can also cure any picture problems you may be experiencing. Find out if you can receive DAB and Freeview in your area. The results are provided by UK DigitalRadio.com and Freeview.co.uk. Go to www.ukdigitalradio.com/coverage/postcodesearch and enter your postcode.